/ Love Makes The World Go Round! Yes, that might be a cliché, but love really is the basis for connection, for healing, for trust, and for a deep-rooted sense of peace and safety. Love is in every interaction we have in our day to day lives, whether it’s with our horses, dogs and cats, our friends, strangers on the street, co-workers, partners, children, parents – the list is endless. And Quantum-Touch Energy Healing is all about the love. It’s an interactive, energy based, heart-centered modality that helps to restore balance and harmony. QT allows us to access that deep knowing place within ourselves and to connect to that inexpressible “something” that is so much bigger than ourselves. With a few very simple breathing and visualization techniques, Quantum-Touch accelerates the healing of emotions, the mind, the body, and of the spirit, in both humans and in our companion animals. Pain, inflammation, emotional distress, and so much more can be helped. We tend to demand a lot from our horses and require them to “do”: to perform and to work for us. It’s interesting to take a moment and imagine how you would be received if you treated a close friend or my partner like that? Many of us can get caught up in the “but I want my horse to do this…” concept; we have a plan and a goal every time we go see our horse. And as we all know, sometimes that plan doesn’t work very well! We can get frustrated and angry. It’s definitely in those moments that taking a step back, breathing, and remembering about the love becomes essential. Our horses want peace, safety, harmony and connection, within themselves and their surroundings. Simply being with our horses, letting them just be who they are and allowing that love to burst forth is healing for us both. With Quantum-Touch, we can connect to the hearts, the emotions and the spirit or our horses, and we can increase those moments of peace, harmony and connection. 1. 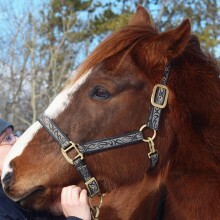 Stand beside your horse with your hands resting lightly on her body and close your eyes. Breathe deeply and relax. 2. With an open heart, connect to that deep quiet place inside you, and offer your love to her. Feel the joy within your own heart and body and soul ever increasing. 3. Send that love and joy to your horse, and you will begin to sense that she is relaxing, you’ll hear her breath deepen, and you will feel her muscles loosen. 4. Sink deeper into the love and joy and peace, and listen to your heart. What does it tell you about her, her needs, her emotions and thoughts? Where does she need help? How can she help you? Share your love with your horse ever time you see her even if it’s for a few moments. And yes, you can even do it from home – just imagine you are with her, touching her, and send your love. Within a short time, you will definitely see a difference in your relationship with your horse! And remember, there is no limit to how deep our love is. Alison Zeidler is a Certified Equine Massage Therapist, Quantum-Touch Practitioner and Instructor, Registered Canadian Reflexology Therapist. She offers her services to both human and animal clients, and she is loved in the Yukon, Canada. Distance healing is also available. www.elementalholistictherapies.ca.